So would you? Nozick suggests that most would not, and there is some evidence to suggest that his intuitive reaction to it is widely shared. Most of us seem to have the sneaking suspicion that if what we are doing turned out to be ‘fake’ — if we were living in some ‘Truman Show’-like world — our lives would be denuded of something important. 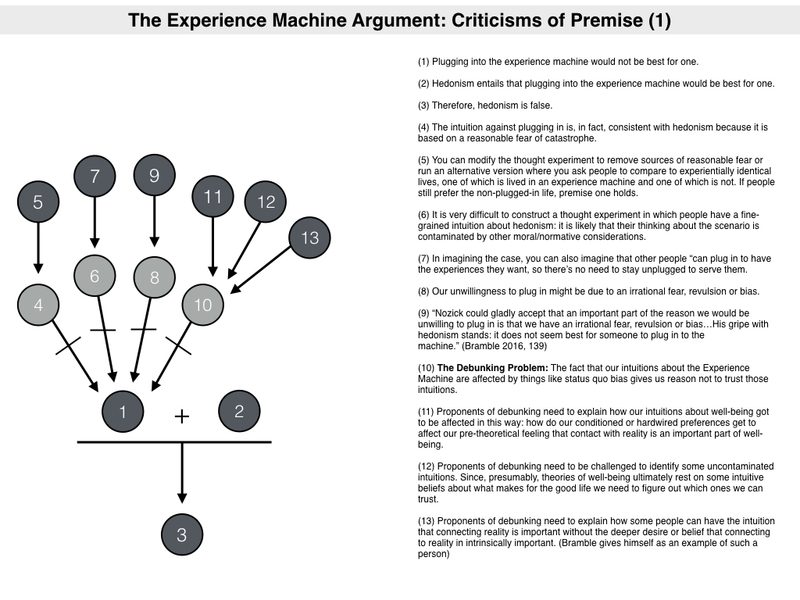 But what is the actual argument that emerges from our consideration of the Experience Machine? And what conclusions are we entitled to draw from it? These are questions taken up by Ben Bramble’s article ‘The Experience Machine’, which recently appeared in Philosophy Compass. This post is my review of that article. Nozick thought that the Experience Machine provided an argument against hedonism. Most have agreed. Indeed, Bramble suggests that the influence of the Experience Machine argument is such that there are few contemporary defenders of hedonism. Hedonism is the view that the only thing that makes a life good or bad for an individual is the extent to which that individual experiences pleasure and pain. Or, to put it another way, it is the view that subjective experiences of pleasure and pain are the ultimate bearers of value — that the personal value of anything else is derived from or reducible to those mental states. Hedonism can be contrasted with other theories of well-being such as desire satisfaction theories or objective list theories. According to the former, what matters for the individual is that their desires are satisfied (even if those sometimes cause them pleasure/pain), and according to the latter what matters is whether the individual achieves or participates in certain objectively good states of affair. (1) Plugging into the experience machine would not be best for one. (2) Hedonism entails that plugging into the experience machine would be best for one. (3) Therefore, hedonism is false. We’ll spend the remainder of the post evaluating various objections to the two premises of this argument. Before we do so, there is an important interpretive point to be made. Some people think that Nozick’s defence of premise (1) rests on an appeal to our subjunctive preferences, i.e. an appeal to what we would prefer to do if we were confronted by the choice to plug into the machine. As a result, these people think that Nozick’s argument presupposes a desire satisfaction theory of well-being. Bramble argues that this interpretation is wrong. Nozick is not really interested in what we would do if confronted by the choice. He is using the thought experiment as an intuition pump, i.e. as a way of prompting us to see that plugging into the machine would not be best. This interpretation is supported by what Nozick actually says in his writings. (4) The intuition against plugging in is, in fact, consistent with hedonism because it is based on a reasonable fear of catastrophe. In other words, people don’t resist plugging in because they think that subjective experiences are not the ultimate determinants of a good life; people resist plugging in because they think something will go wrong and that this will affect the experiences they have while plugged in. For example, people might reasonably fear that “the machine might malfunction, that the premises on which it is kept might be overrun by fundamentalist zealots, that the scientists running the machine might turn evil, etc.” (Bramble 2016, 139). (5) You can modify the thought experiment to remove sources of reasonable fear or run an alternative version where you ask people to compare to experientially identical lives, one of which is lived in an experience machine and one of which is not. If people still prefer the non-plugged-in life, premise one holds. (6) It is very difficult to construct a thought experiment in which people have a fine-grained intuition about hedonism: it is likely that their thinking about the scenario is contaminated by other moral/normative considerations. So, for example, when people are asked whether they would plug in or not they might think about their obligations to friends and families and how they would be breaching those obligations by abandoning reality. Consequently, it is difficult to enable people to have an intuition that is solely about well-being. (7) In imagining the case, you can also imagine that other people “can plug in to have the experiences they want, so there’s no need to stay unplugged to serve them. Bramble says little more about this line of argument, but I will. A concern about family and friends might be thought to provide another argument against hedonism since it suggests that we have non-experiential intuitions about what the good life consists in. This is something that Samuel Scheffler has explored in his various doomsday thought experiments. These thought experiments ask us to imagine that we are living in a world that is going to end thirty days after our deaths or a world in which the entire human race is going gradually infertile. Scheffler suggests that our aversion to these scenarios reveals a strong altruistic element to our conception of well-being. So what might be emerging from these fears about family and others is the intuition that hedonism is not the only thing that matters. Nozick’s modified thought experiment does not eliminate this intuition rather it accommodates it. Of course, that’s all to the good as far as he is concerned. His goal, after all, is to disprove hedonism. To that extent the affinities between Nozick’s experience machine and Scheffler’s doomsday scenarios seem like they are worth exploring. (8) Our unwillingness to plug in might be due to an irrational fear, revulsion or bias. In other words, unlike the reasonable fear of catastrophe previously discussed, our resistance stems from an unreasonable fear or bias. As Bramble puts it: “Perhaps we’d refuse to plug in because we’d be too scared of having wires inserted into our skull…[or because of] an irrational tendency to prefer the way things are now to new or different ways” (2016, 139). What’s more, there is some evidence to suggest that status quo bias of the latter type affects how people think about the Experience Machine. 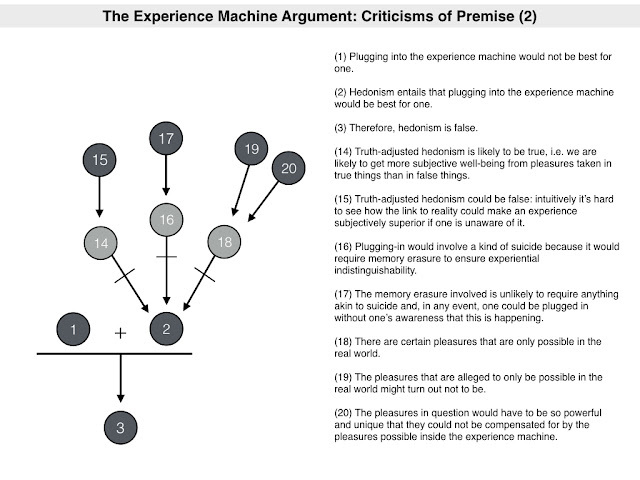 Experimental philosophers like DeBrigard have run alternate versions of the thought experiment where people are told they have been living in an experience machine up to this point in their lives and asked if they would like to plug out. In those cases, people are reluctant to do so, suggesting there is a bias to the status quo. (10) The Debunking Problem: The fact that our intuitions about the Experience Machine are affected by things like status quo bias gives us reason not to trust those intuitions. This line of objection follows the standard debunking argument playbook (something I have discussed at much greater length before). It suggests that there is no reason to think that our intuitions in the Experience Machine case track the axiological truth (the truth about what is good and bad). Instead, our intuitions are the products of social/behavioural conditioning or evolutionary hardwiring. (11) Proponents of debunking need to explain how our intuitions about well-being got to be affected in this way: how do our conditioned or hardwired preferences get to affect our pre-theoretical feeling that contact with reality is an important part of well-being. (12) Proponents of debunking need to be challenged to identify some uncontaminated intuitions. Since, presumably, theories of well-being ultimately rest on some intuitive beliefs about what makes for the good life we need to figure out which ones we can trust. For what it’s worth, I find (12) to be the most persuasive of these challenges and it gets to the heart of the debunking debate. I’m less convinced by the other two. I’m not sure how highly specified debunking theories need to be in order to be persuasive (11) and I think the debunking project can probably tolerate a few outliers (13). 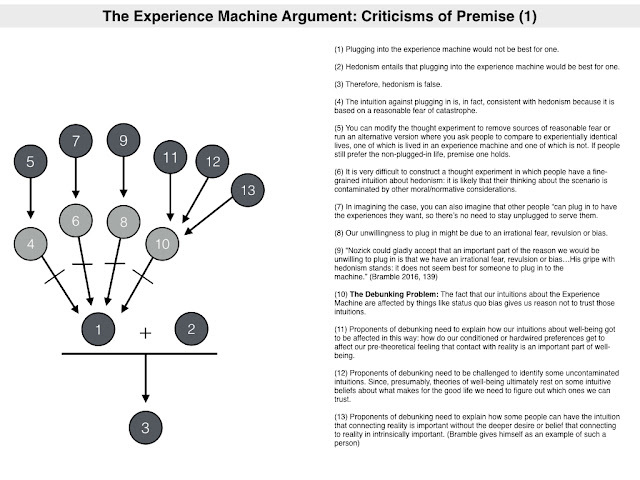 Relatively few people challenge the second premise of the Experience Machine Argument, but there are some things to be said against it. They all boil down to pretty much the same thing: there are reasons to think that your subjective well-being may not be best served by plugging into the machine. These criticisms tend to be empirical/contingent in nature. They are not really ‘in principle’ objections. They dispute Nozick’s claim that life in the machine would be experientially identical to (or better than) life outside. (14) Truth-adjusted hedonism is likely to be true, i.e. we are likely to get more subjective well-being from pleasures taken in true things than in false things. There are a few problems with this response. The most obvious is that truth-adjusted hedonism could well be false. I certainly don’t have any strong intuition in its favour. 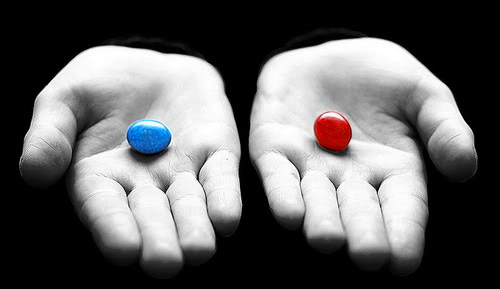 If two states of being are so subjectively similar that I cannot distinguish them, it is hard to see how the mere fact that one involves subjective connection to something that is true could add more experiential well-being than one that is connected to something false. Or to put it another way, I think subjective knowledge of the connection to reality is probably the only thing that could make subjective pleasures taken in things that are true experientially better than subjective pleasures taken in things that are false. Without that knowledge of truth/falsity, I can’t see how the two things could be different. Nozick explicitly rules out that knowledge in the thought experiment. On top of this, I think the pleasures of virtual reality could be just as ‘true’ (in many instances) as the pleasures of real reality. (15) Truth-adjusted hedonism could be false: intuitively it is hard to see how the link to reality could make an experience subjectively superior if one is unaware of it. (16) Plugging-in would involve a kind of suicide because it would require memory erasure to ensure experiential indistinguishability. Bramble is dismissive of this objection. He questions whether tampering with someone’s memory in this manner would require anything close to suicide and also suggests that it would be possible to enter the machine without being aware that one’s memory needs to be erased. For example, you could be plugged in by someone else while you were sleeping. You would then wake up in an experientially similar world that just happened to be an elaborate simulation. You would be none the wiser. It’s hard to see how you wouldn’t survive this process. (17) The memory erasure involved is unlikely to require anything akin to suicide and, in any event, one could be plugged in without one’s awareness that this is happening. (18) There are certain pleasures that are only possible in the real world. This might be the most promising criticism of premise (2) but the devil is in the detail. What might these unique, reality-only, pleasures be? Bramble considers two possibilities: (i) the pleasures that come from exercising free will (if you are in a simulated environment you cannot really exercise free will) and (ii) the pleasures of love and friendship. The problem in both instances is that it is not clear why these pleasures are ruled out in a simulated environment. For example, there are many accounts of free will, some of which would allow for free will in a virtual world. It would be too time-consuming to consider each particular account now but the point can be made with a commonsense example: I play video games all the time and they certainly seem to allow for exercises of genuine free will (whatever it might be). I exercise the free will in a constrained game environment and the consequences are limited, but it is no less real for all that. Additionally, there is no obvious reason why one couldn’t experience friendship and love in a virtual world. Another problem with both examples is that whatever pleasures they might bring would have to be so powerful and so unique that it trumped or outweighed the subjective pleasures that would be possible inside the experience machine. (19) The pleasures that are alleged to only be possible in the real world might turn out not to be. (20) The pleasures in question would have to be so powerful and unique that they could not be compensated for by the pleasures possible inside the experience machine. Okay, that brings me to the end of this post. 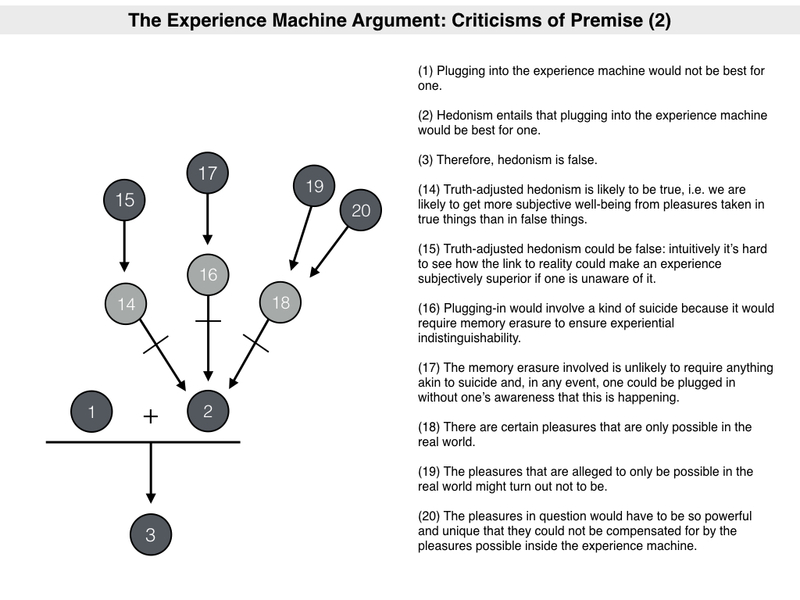 To briefly recap, the Experience Machine argument is supposed to provide a case against hedonism. The argument is premised on the belief that (intuitively) plugging-in would not be the best thing for us and yet hedonism entails that plugging in would be the best thing for us. There is an obvious contradiction between these two premises so something has to give. As Bramble has shown, however, there are reasons to challenge both premises, although each of these challenges has its problems. I should close by noting that Bramble himself is a defender of hedonism. He has an interesting paper written in defence of hedonism that just came out in the journal Ergo. It takes a look at three leading objections to hedonism, including the experience machine argument. I recommend checking it out.